It was my friend Jeanne’s birthday, and Facebook reminded me to wish her well. I would have dearly loved to do so, but, well, sadly, Jeanne died over a year ago. This is the sort of thing that can happen – intentionally or unintentionally – with one’s digital (virtual) assets after death. You can purposely leave an account in place, or maintain a website as a memorial to a loved one (among other reasons)… or you might instead find yourself scrambling to figure out how to delete it if there was no plan in place and things are happening that you hadn’t foreseen. Yikes! 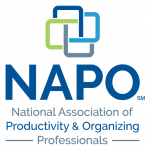 So, I was already very interested in this topic when I attended the NAPO (National Association of Professional Organizers) conference last week in Scottsdale, AZ. I couldn’t wait for the session entitled “Advance Planning for Your Virtual Afterlife”, presented by Heather Ahern, owner of The FUNctional Home. 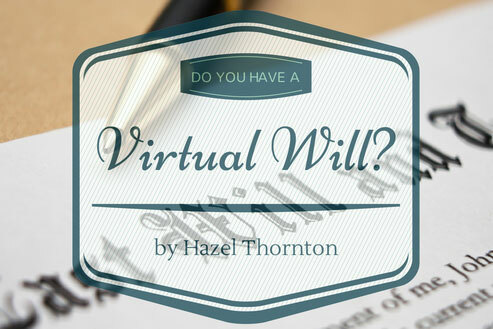 Heather says only 40% of us have a will. And I’ll bet only a tiny fraction of that number have a well-thought-out inventory and plan for their digital assets; a virtual will. We’re not just talking about online bank accounts, user ids, passwords, and answers to secret questions. We’re also talking about the plethora of social media sites where depositories of photos, videos, and other pieces of ourselves and our loved ones reside in this digital age. Websites full of blog posts. Files full of music. What about accounts such as southwest.com, amazon.com, or paypal.com where one might have caches of frequent flyer points, gift card balances, or actual cash? Did you know that dormant accounts can be used for identity theft purposes? And who is going to check your email when you die? The problem with giving specific advice as to how to address each of these issues is that laws have not caught up with our technology. There are no uniform policies across technology platforms, states, or countries. One of the resources Heather recommended was a book called Your Digital Afterlife, by Evan Carroll and John Romano, which is featured along with other resources on their website, The Digital Beyond. She was kind enough to give me her extra copy, but I haven’t had a chance to read it yet. Perhaps you could read it too, and we can compare notes? I may be writing more about this topic in the future. What questions do you have? What has been your experience? Please share with us by leaving a comment! P.S. I need to rethink my own virtual will in light of the fact that Jeanne, my friend whose birthday I was reminded of by Facebook, was my personal computer guru. I was counting on her to be my digital executor, since my family and closest friends are not especially computer savvy. This is a case in point for reviewing plans periodically even if you do have them in place! 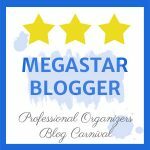 NOTE: I wrote this as a guest post for Janet Barclay’s Your Organizing Business blog, and it was originally published there. I hope you enjoy it, and that it motivates you to consider this important issue! As always relevant useful info! Thx Hazel! Ah, this is a “pingback” from a blog post on companioncare.com by Martyne Backman, who recently attended my presentation “Who Will Check My Email When I Die?” I’m glad you were inspired by my presentation, Martyne!